There are many different types of grow lights and grow light bulbs on the market. Different factors will affect which grow light bulb is best for you. The two main factors you should consider are wattage and spectrum. Figuring out the wattage you need will depend on tent size, plant coverage, and light type. The last one is important to remember and not all light wattage is created equally. A 200W HID delivers lights much more efficiently than a 200W CFL. As a general rule of thumb, you’ll want a minimum 23-30 watts of light per square foot. If you have a grow space that is 4’ by 4’ you’ll want at least 400 watts to fill the space. Since fluorescents are weaker you’ll times that by 5, so 115-150 watts per square foot. Color temperature has a strong influence overs plants and different temperatures will affect plants in different ways. A blue or bright white found in the temperature range of 5000 K is recommended for plants in the vegetative stage as it keeps them short and bushy. The temperature range around 3,000 K that produces a yellow or red light is strongly recommended for flowering plants. If you can only afford one temperature for the entire growing period, it’s recommended to stay in the lower range of 3,000- 4,500 K.
At Hydrobuilder, we offer four single ended bulb types: High Pressure Sodium, Metal Halide, Dual Arc, and Conversion (HPS <-> MH). Tent size and cost play a large part in a grower’s choice when it comes to their wattage need and as such we offer single ended bulbs that range from 100 watts all the way up to 1,100 watts. For example, larger growing spaces should probably consider a double ended bulb, since these are more powerful and more efficient. However, if you are a beginner, or have limited space, use an SE bulb. These will pose less risk of burning your plants, and for small spaces, do just fine. We know how important it is for growers to be able to customize their lighting spectrum. That’s why we offer bulbs with the following color temperatures: 2000, 2100, 2800, 3000, 3200, 4000, 4200, 4250, 4500, 5000, 5200, 5500, 6000, 6500, 7000, 7200, 7500, and 10000 K.
Expect to spend anywhere between $0.05-$0.20 per watt depending on brand and HID type. Get the most out of your HID light setup with double ended bulbs that deliver bigger yields while using less energy. Unlike SE bulbs, these connect to both sides of the fixture. The way they operate allows them to provide more usable light more efficiently. For more information on how to install a DE grow light, check out this guide. 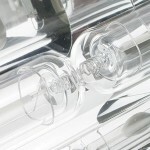 We offer both HPS and MH double ended bulbs available in 600, 750, and 1,000 watts. We also offer them in a range of different color temperatures: 1900, 2000, 2100, 4000, 6000, and 1000 K.
Expect to spend anywhere between $0.05-$0.20 per watt. CMH grow lights are the most effective source of HID lighting available. They are different from MH and HPS in both the way they operate, and their composition. While a CMH grow light is more expensive than traditional HIDs, they are far more efficient. These bulbs last way longer, and provide a more intense light. Most CMH bulbs are available in 315 watts and deliver better growth per watt compared to HID lights. 4,200 K is the most common color temperature we offer, but we also offer CMH lights in 3000, 3100, 3200, and 1000 K.
Often, you can only find CMH bulbs that are 315 watts and may find it annoying to have to buy multiple CMH bulbs which each will need their own ballast and reflector. While a CMH bulb is a fantastic size for most home growers, larger operations will simply need more. We do offer double ended CMH that range from the common 315 watts all the way up to an incredible 1000 watts. Our double ended CMH are available in three color temperatures: 3000, 3100, and 4200 K.
Expect to spend anywhere between $0.20-$0.30 per watt depending on brand. 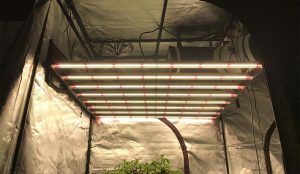 Fluorescent tubes are great for growers that want a higher intensity light compared to CFLs, but can’t afford the height & investment requirement that other lights require. These lights are great for propagation, and can be placed much closer to the canopy of your plants. We offer 4 available bulb lengths: 18”, 2 ft, 3 ft, and 4 ft that are 17, 24, 39, and 54 watts respectively. Our fluorescent tubes wonderfully cover the color temperature spectrum and we offer tubes available in the following spectrums: 3000, 5000, 5200, 5500, 5850, 6400, 6500, and 8000 K.
Expect to spend anywhere between $0.70-$1.20 per watt depending on brand. CFLs are often a go-to for beginners, as they have an affordable startup cost. Most growers are already familiar with these, since they are the common home lighting fixture. However, those lights are usually too low in wattage and you will need to buy CFL bulbs that are at least 24 watts. Make sure you’re looking at and calculating the actual wattage and not the equivalent wattage. CFLs are great for mixing and matching spectrum and we offer the following color temps: 5400, 6400, and 6500 K.
Expect to spend anywhere between $0.30-$1.80 per watt depending on brand and type. View All Our Grow Light Bulbs Here! Want to learn more about grow lights, and how to decide which is best for you? Check out our full guide on choosing your grow lights, as part of our learn to grow series.